I am trying to put on a harder business hat this year. I have been told by many people, from other small business owners to actual customers who have just purchased my work, that I am not charging enough. I have struggled with this a lot, the urge to start paying off some of my initial outlay has led me to put prices so low that I end up paying myself less than minimum wage and not making any profit. It is very easy to become scared of pricing. 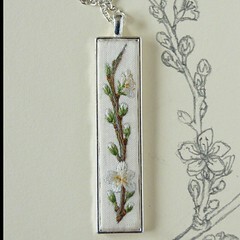 After doing a basic Etsy search for ’embroidered pendant’, the average price seems to be between £20-£25. I am at a loss as to how anyone can make a profit at this price. To start this year I am working on five new designs after being introduced by Mother Eagle to embroidered jewellery frames by Kailea on Etsy. The designs are inspired by my love of autumn but looking forward to the hope of spring and summer. I am also using a more stylized design, after doing some sketches inspired by Celtic artwork I am employing a much more free technique, I am loving the swirl. I start with a curl to fit the jewellery shape and then see where it takes me. I had started on the field bindweed design but I wasn’t satisfied with it so I have gone back to the sketch. This Saturday I am off to Libertys to attend their open call. I am not really going with the idea of getting my work stocked, I think it will be a great opportunity to get some professional advice. Can I really charge the amount I need to (probably nearer the £80-£90 mark) or do I need to completely rethink my work. I am extremely nervous, I can’t completely get the thought of being laughed out of the room out of my head. Ah well, nothing ventured, nothing gained. Wish me luck!